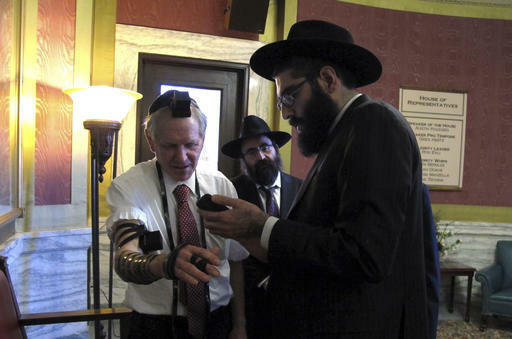 Rabbi Berry Nash, right, prays as Montana Rep. Dave Fern, R-Whitefish, wears boxes containing Torah versus called Tefillin on Wednesday, Jan. 18, 2017 in Helena, Mont. Nash was among a delegation of Orthodox Jewish rabbis from the U.S. and Canada who met with Fern and other state leaders to thank them for defending the Jewish community in Whitefish when it was threatened and harassed by white supremacists last month. (AP Photo/Matt Volz). Orthodox Jewish rabbis said Wednesday they will counter white supremacists' harassment of the Jewish community in the Montana town of Whitefish by sending students to visit the Auschwitz concentration camp and by mailing a Torah to every Jewish family in the state. The delegation of rabbis from Canada and across the U.S. presented Montana Gov. Steve Bullock with a copy of the holy text and thanked him for defending the state's Jewish residents. "We hope to inspire you to be a source of strength in the future for the Jewish community and that these horrible threats and terrible words of bullying and intimidation never come to a reality," said Shmuel Herzfeld, rabbi of the prominent Ohev Sholom congregation in Washington, D.C.
Whitefish became a focal point for white supremacist anger late last year after the mother of white nationalist leader Richard Spencer said a local real estate agent pressured her to sell her property in town. A website called the Daily Stormer called for an internet troll storm against "Jews targeting Richard Spencer's mother for harassment and extortion," which prompted death threats to members of the Jewish community and a group that promotes diversity called Love Lives Here in the Flathead Valley. The website also tried to organize a march of armed white supremacists through Whitefish on Monday, Martin Luther King Jr. Day. The march never materialized after problems with the group's event permit, but about 50 counter-protesters showed up and marched through the town instead. The delegation of rabbis arrived in Montana from Washington, D.C.; Montreal; Sacramento, California; and San Antonio, Texas. They were hosted by Orthodox rabbis from Bozeman and Missoula. The group said they have raised enough money so far to send Torahs to 350 of the estimated 1,500 Jewish families in Montana. They also plan to raise money through their congregations to send four non-Jewish students from Whitefish to the Auschwitz-Birkenau Memorial and Museum in Poland. After the trip, the students would then travel the state and tell other students what they learned. More than 1 million people died in the Nazi concentration camp during World War II. Bullock said in response that people should never forget the horrors of Auschwitz with the passage of time and they should never accept intolerance. "What happened in Whitefish, that's not who we are," Bullock said. "Certainly as the governor, I will continue to underscore who we are." The delegation also met with legislative leaders and representatives from northwestern Montana before they headed to Whitefish to meet with Jewish community members. One of those lawmakers, Rep. Dave Fern, D-Whitefish, said he is Jewish but he sees no difference between Whitefish and the rest of the nation — there are bad apples everywhere. "Sometimes we come to the intersection (where) free and obnoxious speech meets with religious liberty and freedom," Fern said. "I think it's a wonderful challenge for our community to stand up." I have lived near Whitefish, MT and also near Hayden, ID. What Richard Spencer does not understand about the area is that neo-Nazi nut cases are tolerated as long as they stay in the mountains on the Montana-Idaho border and they don't bother anyone. His mistake is in thinking he can spew his racist views in town. I have all the faith in the world that the Montanans will run him out. Montanans are the salt of the earth and a light to the world. The pope will visit a section of Romania with a large ethnic Hungarian population—and a Marian shrine that has attracted allies of the autocratic, anti-migrant Hungarian leader Viktor Orbán. All journalists should be humble because we are so often wrong.